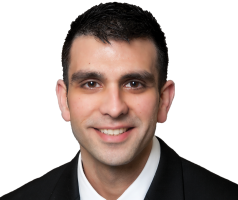 Dr. Yasha Kayan, MD (formerly Yasha Kadkhodayan, MD), joined Consulting Radiologists, Ltd. (CRL) with a specialization in Neurointerventional Radiology. He received his bachelor’s degree from the University of Illinois at Chicago and his medical degree from Washington University School of Medicine in St. Louis, Missouri. He then completed his residency in Diagnostic Radiology, a fellowship in Neuroradiology, and an Endovascular Surgical fellowship at the prestigious Mallinckrodt Institute of Radiology at Washington University School of Medicine in St. Louis. He has gained significant recognition for his research and received the Roentgen Research Award from the Radiological Society of North America in 2009 for outstanding radiologic research. Additionally, he earned the Executive Council Award from the American Roentgen Ray Society in 2012 for outstanding clinical research. When asked what he likes best about his job, Dr. Kayan replied, “Interacting with patients and their families and having the opportunity to improve the lives of patients with critical neurological illnesses using the latest neurointerventional technology.” When not working, he can be found running, hiking, appreciating architecture, and exploring Minnesota with his family.